Once again motoring and motorsport enthusiasts…and petrolheads…can look forward to a delicious menu of classic motor cars, historic racers and performance demonstrations to whet most appetites at this year’s Goodwood seasonal events. In mid-summer the Festival of Speed will be held on the weekend 12-14 July (this was moved from the original date to avoid a clash with the revised German Grand Prix in order that the Festival can continue to host current F1 teams and drivers), while the Revival will be run on 13-15 September at the Goodwood Circuit. 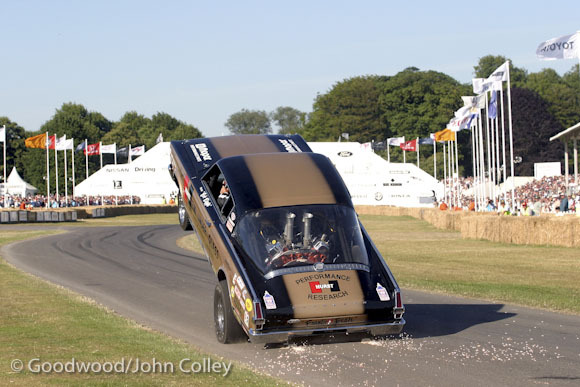 The 2013 Goodwood Festival of Speed theme will focus on highlights from the event’s glittering 20 year history as it celebrates this popular motor sport and car culture event. For starters, the organisers have a treat in store for visitors with the return of Bob Riggle with his amazing ‘Hemi Under Glass’ 1965 Plymouth Barracuda. The unique Barracuda has a snarling Chrysler 426 Hemi engine stuffed in where the rear seat used to be, earning it the nickname ‘Hemi Under Glass’ following various popular appearances in the US in the late 1960s. This year the Festival is to honour one of the world’s most versatile and popular sports cars, the Porsche 911, which celebrates its 50th anniversary. The main Central Feature on the lawn outside Goodwood House will be a 911-inspired sculpture which promises to be a highly distinctive installation. The list of racing heroes reads like a ‘who is who’ of the motorsport world, and the surnames include: Aaltonen, Attwood, Brabham, Brack, Brookes, Brooks, Chandler, Coulthard, Elford, Fonda, Graham, Mass, Merzario, Mikkola, Pescarolo, Percy, Pirro, Redman, Reid, Sears, Soper, Unser and Whitmore, with many other star drivers and riders yet to be confirmed. The fourth dedicated Goodwood Aviation Exhibition is also set to expand for 2013 as a fully integral part of the Festival of Speed and Moving Motor Show. This popular added Festival attraction will be directly adjacent to the numerous and varied other Festival activities. Billed as a ‘step back in time’, the Goodwood Revival offers visitors a unique chance to revel in the glamour and allure of motor racing as seen during the romantic years of the 1940-1960s. Set in a veritable time capsule, most race goers dress in period costume and enjoy what must be the biggest and best historic motor racing party of the year, while some of the most revered and iconic racers go head-to-head in all-out racing around Goodwood’s classic circuit. The Revival in the autumn will be staging a unique all-Ford GT40 race to mark 50 years since development of this exceptional mid-engined Anglo-American racer first began. The world’s finest collection of significant and authentic racing Ford GT40s will be gathered at the Revival for this one-model race, the first time in history that a dedicated competition has ever been held for these iconic Ford racers. Also celebrating a half-century is the iconic Ferrari 250 LM, having premiered at the Paris salon late in 1963. Like the Ford, the 250 LM went on to win the Le Mans 24 Hours race with the North American Racing Team-entered car driven by Jochen Rindt and Masten Gregory. The 250 LM also raced in the Tourist Trophy at Goodwood in 1964, where it finished fourth. For the 2013 Revival, a number of 250 LMs will be returning to the Royal Automobile Club TT Celebration race for the first time in 13 years, campaigning against the likes of the Ferrari 250 GTOs, AC Cobras, lightweight Jaguar E-types, Maserati 151s, Aston Martin DB4s and many other rare machines, to create the most valuable historic motor race in the world.